Our focus fundamentally revolves around building soil fertility, with healthy soils being our greatest farming asset. Our health is inextricably linked to soil. Healthy soil is needed for healthy grass which in turn feeds the cattle we consume. 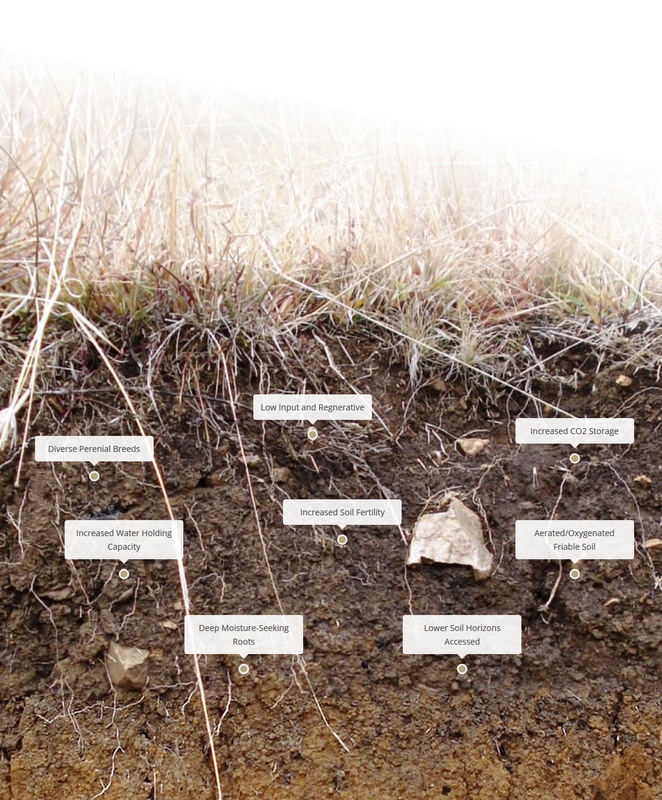 What is in soil, and what makes it healthy? Well to this day, scientists have not cracked the code on soil. Let’s just leave it as an amazing mystery for now. And sorry to frustrate you again, but soil health, like many things in nature, cannot be boiled down to one factor. But we do know that soil health is linked to microbes. Our grasses have a symbiotic relationship with the microbes living in our soil. Root exudates, containing minerals and sugars, feed beneficial (hopefully) microbes. In turn, these microbes form a barrier against pathogens that attack the roots. Ever helpful microbes also break down bits of the parent rock (foundational base of soil) to release minerals that were previously unavailable to roots. With more nutrition, grass roots grow stronger (calcium) and have better soil penetration, creating tiny pockets of air. These spaces with increased oxygen enable even more microbes to thrive and handily double up as water storage areas. To round off (in case you forgot, the question was what makes soil healthy), microbes are the indispensable go-betweens that boost plant and soil health, and by doing so, their own health – Nature’s triple win! The Gundooee herd graze on a nutrient dense pasture. They have a selection of up to 70 different perennials on their plates to munch on. Eating is their primary past time and they just love doing it as there is so much choice. After much belching and farting, ‘dung’ is excreted from the cattle approximately 24 to 72 hours after it entered their chops. This dung pile may not seem that exciting or even a little disgusting to the human eye, but it provides food for another important but often overlooked little critter, the dung beetle. The dung beetles take their feast of dung into the soil, opening it up and making food available for plants and microbes. Our cattle can produce in excess of 5 tonnes of cow-poo each day, and such excellent potential should not be wasted. What makes the difference between unavailable nutrients (dirt and parent rock) and available nutrients for the grass to access? Microbes. Microbes make nutrients available to the plants which in turn flow into the cattle when eaten. We’re very open about our process. Curious to know more about our organic certification or a cattle’s process through the Abattoir? Answers to these and more are available in our customer FAQ’s.